I gave Colossal Media a lot of crap for being the company that painted the Banksy Murals in downtown New York back in 2008. I was upset with the fluid relationship they established with the artist. This relationship worried me and my general concerns for how individuals bring their personal messages to the cities walls. If artists would need to pay to use their city walls, many would be left stunned by their inability to purchase their own public space. That said, I would like to at least commend Colossal's use of several spaces around the city which have been adorned with murals similar to the one shown above. The murals are often humorous street scenarios that relate to the neighborhood they are in and often provide some critical message. 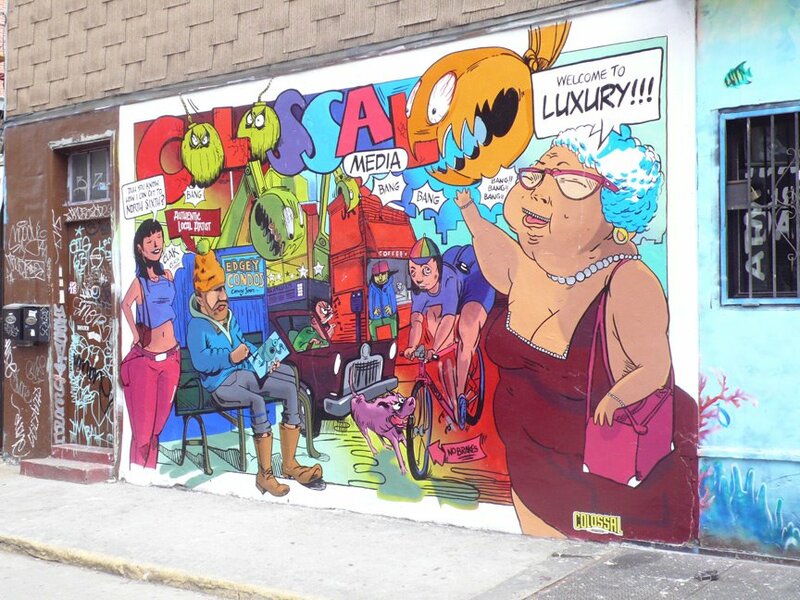 This mural at North 5th and Bedford, critiques the gentrification of Williamsburg with the words "Welcome to Luxury" looming over the rest of the scene. I wonder what the old timers think of it. I wonder what the ATM's think of it. Great work here! The logo is showing utmost details of company.